I’ve found an excellent way to keep a New Year’s resolution is knowing you’ll have to write a column about it. Waking up on New Year’s Day with a stomach full of pizza, prosecco, vodka, beer, cocktails, sambucca (you get the picture) and feeling as though I had an opera singer warbling in my head, it became clear that abstaining from junk food and alcohol was not going to happen this year. After a term plagued by anxiety, I decided against resolving to do anything, and instead resolved to be something: Mindful. Despite my dry mouth and pounding head, I felt reassuringly calm as I entered into 2016, and thankful for a clear point at which to start again: taking up Mindfulness seemed like the perfect way to maintain this calm. 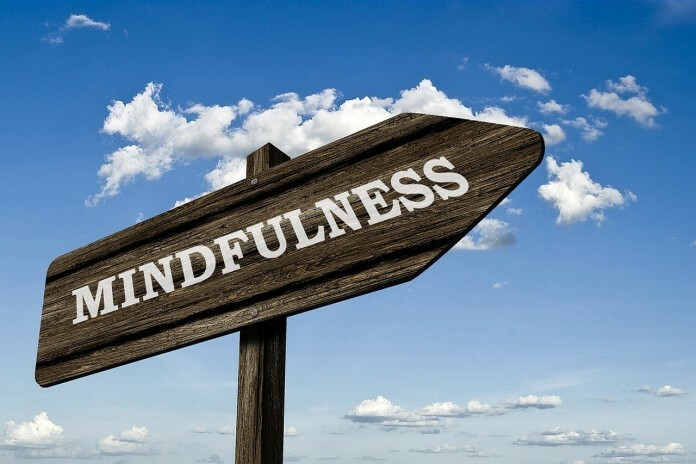 Mindfulness has become somewhat of a buzzword recently, particularly in mental health treatment. Essentially, it is a simple form of non-spiritual meditation, which enables people to view their negative thoughts and problems, without judgement. Instead of being drawn into a spiral of destructive thinking, Mindfulness trains you to stand back and observe feelings of stress, anxiety, or depression with curiosity, so that you can control the thought patterns before they control you. There have been numerous peer-reviewed papers which have asserted the benefits of this meditation, which has been proven to: improve memory and reaction times, improve quality of life in sufferers of chronic pain, reduce addictive behaviour, and be at least as effective as medication and counselling for clinical depression. People who suffer from panic attacks and anxiety have an overactive amygdala – which evolved to activate our fight or flight response in pre-historic times. Essentially, they are always poised to flee from danger which is not actually there. Practicing Mindfulness can effectively rewire the brain, so that we spend more time exercising the rational part of our brain, and developing the hippocampus which is responsible for learning and memory. Initially, the term ‘meditation’ triggered alarm bells for me. I envisaged myself sitting cross-legged on a mat, inhaling incense, drinking nothing but green tea, telling everyone ‘I’m totes spiritual’, and just generally being a bit of a wanker. Thankfully, after some research, I was proved wrong. I began by downloading a ten day trial of the Headspace app. This involved ten daily mindfulness sessions of ten minutes each, which involved concentrating on my physical bodily sensations from head to toe before focusing my attention on breathing – first the sensation of breathing in and out, and then slowly counting breaths. Every so often, a voice over gives a gentle reminder to return your attention to your breathing, acknowledging where your thoughts have gone if you have lost concentration. Initially, I found staying focused very difficult. My mind would wander to catastrophic thoughts that I might be going mad, or losing touch with reality, and it was a conscious struggle to bring my thoughts back to breathing. I persevered for ten days, however, and then decided to embark on an eight week Mindfulness course, in the form of a book and accompanying CD entitled ‘Mindfulness: Finding Peace in a Frantic World’. Written by Mark Williams; professor of Clinical Psychology at Oxford University, and Danny Penman; a meditation teacher, writer, and journalist, the book is a seminal work in the field of Mindfulness. In week 2 of this term, I decided to attempt the first week of the course. I was still undeniably crap at focusing, but I noticed that this time, my mind was no longer distracted by the way in which I may accidentally die or ‘go a bit cray’. Instead, I’d be thinking about whether I could justify walking across campus for some curly fries. If stressful thoughts did arise, it was usually because of an overdue essay, and I chose to put these thoughts aside until after the Mindfulness session. It was recommended that I attempt two sessions per day, and I found I was considerably more productive after a morning session. I was able to prioritise better, and benefitted from putting my thoughts aside for ten minutes, which meant that when I returned to them, only thoughts about the truly important tasks stayed with me. As a student, practicing Mindfulness twice a day is not always practical. Some mornings I chose sleep over my early sessions. On these days, I was invariably less productive – in part because oversleeping meant I had to rush to lectures and had no time to plan my day. I have noticed that I am no longer consciously aware of being anxious, because I am able to address any negative thoughts before they have time to take root. Perhaps the worst moment of my week was when I awoke after a night out in discomfort so intense that at 5am I googled whether it was possible to die from a hangover. I lay in bed hugging a cardboard pizza box with my heart palpitating, my stomach convulsing, and my head spinning, and panicked about my impending doom. I necked a pint of water, and decided to play a Mindfulness track. Now, this by no means got rid of the taste of regret and fanta in my throat and the brawl between vodka and pepperoni in my stomach, but I was able to focus solely on breathing in and out, and had soon distracted myself from my imminent death. I relaxed so much that I was able to return to sleep, and, as if by magic, I didn’t wake up dead five hours later. I am in no doubt that I will continue with the eight week course, as the benefits have already begun manifesting themselves. With any luck, by the end of term I will have mastered the art of Mindfulness and will no longer need to rely on a CD to instruct me. I would highly recommend it to anyone struggling with mental health issues, stress, or who needs to dedicate more time to looking after themselves. Or anyone panicking in the early hours of the morning that they may be about to die at the hands of eight strawpedoed VKs and an armful of Jaegarbombs.